Now you can have something fun on your head all thanks to this Rick And Morty Running Cap. 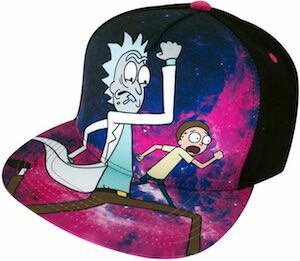 The cap is black but on the front you can find some purple blobs in the background and on top of that you can see Rick and Morty running away from something. On the back you can see that the hat is adjustable so that it fits almost anyone and above the size adjuster it says “Rick and Morty” so that people behind you will know that you like this crazy cartoon and maybe even pass you to see what is on the front.